Rapidly growing nodule that often bleeds. Pyogenic Granuloma is a common benign tumour of the blood vessels (a Vascular Tumour). 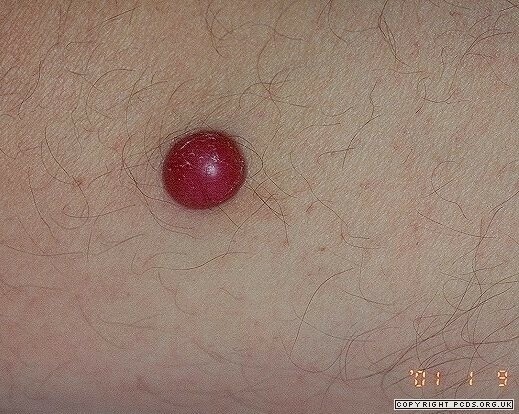 The growth is neither pyogenic (pus-forming) nor a granuloma (inflammatory lesion) – but the name has stuck. The problem with pyogenic granuloma is that if often bleeds. The lesion grows over just a few weeks and is most commonly located on the head or neck, arms, legs & trunk – most places in fact! Overall, though, it is most common on the head and neck. The growth is most commonly seen in children and young adults. The condition becomes less common with increasing age. Pyogenic Granuloma often occurs in the middle of pregnancy. Overall, the growth occurs in around 2% of pregnant women. It is often found on the lips or gums. What does a Pyogenic Granuloma look like? 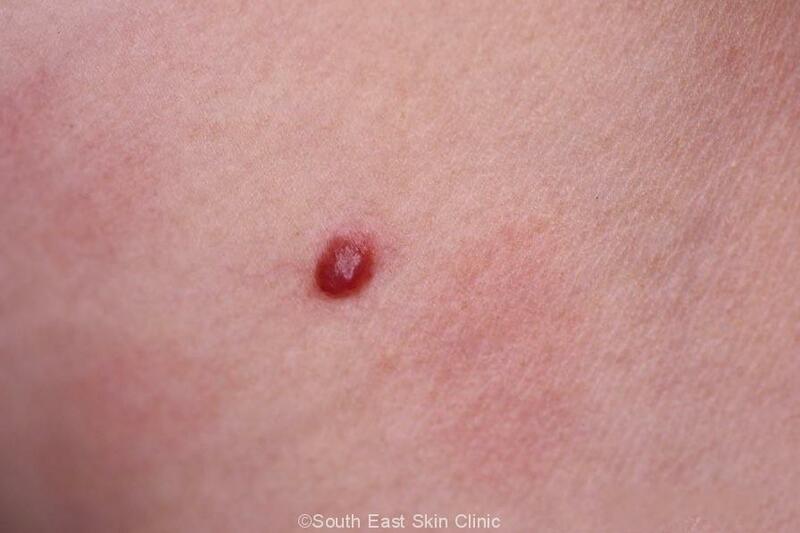 Pyogenic Granuloma projects out of the skin as a round or oval nodule and is usually around 5-10 mm in size. The Vascular nature of the tumour makes it shiny and red or red-brown. There is often a “collar” of scale around the base. 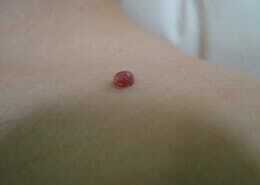 The typical Pyogenic Granuloma is said to look like a raspberry. The lesion will feel quite soft, and bleed easily. The most important alternative diagnoses are amelanotic melanoma, Spitz nevus, nodular BCC and SCC. 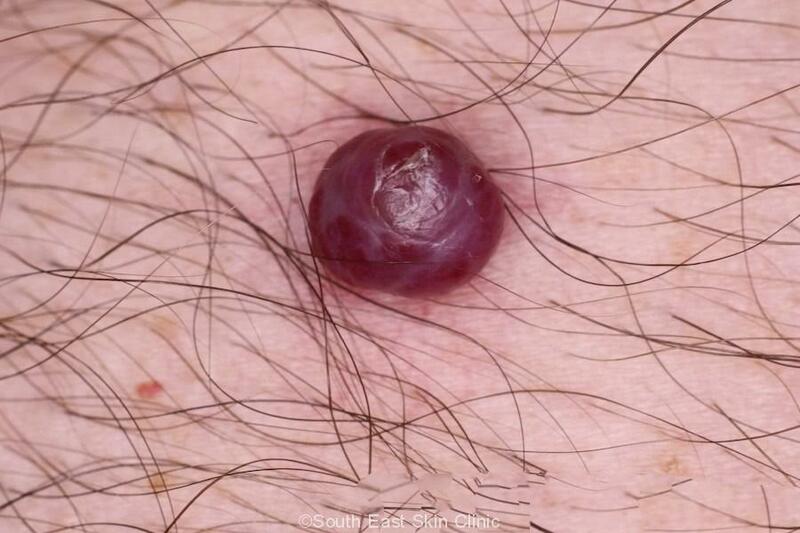 Of these, amelanotic melanoma is the big one not to miss. What is the treatment of Pyogenic Granuloma? Pyogenic Granuloma is normally treated because it bleeds easily and does not go away on its own . The main treatment used is Curettage under local anaesthetic. Pyogenic Granuloma may sometimes re-occur after excision and then be treated with further surgery or Cryotherapy. Imiquimod cream may have a role to play, particularly when surgery is not indicated. The cream was shown to work in a study of imiquimod cream for Pyogenic granuloma of the face in young children. You can’t ignore a Pyogenic Granuloma as they look awful and tend to bleed.